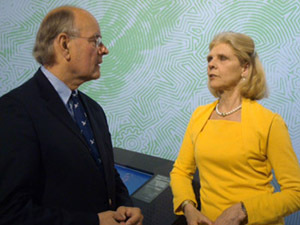 On 22 May, invited by ABN AMRO bank, Annet Ardesch and Bert Biemans visited the exhibition ‘Constantijn & Christiaan Huygens, Een gouden erfenis’ (‘A golden legacy’) in the Grote Kerk in The Hague. 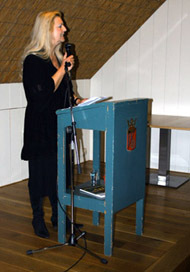 During this meeting, Ms Reinildis van Ditzhuyzen gave an interesting lecture on the two men in the context of their time. 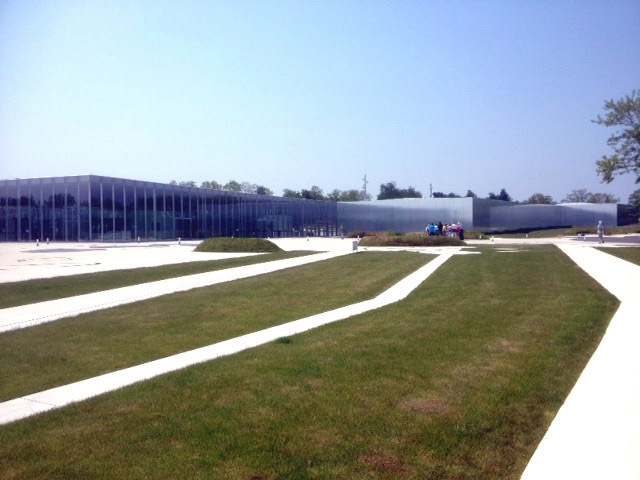 On 8 June, Bert Biemans visited the recently opened museum Louvre-Lens near Lille. 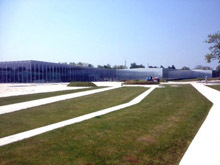 An impressive museum, partially funded by the European Union. 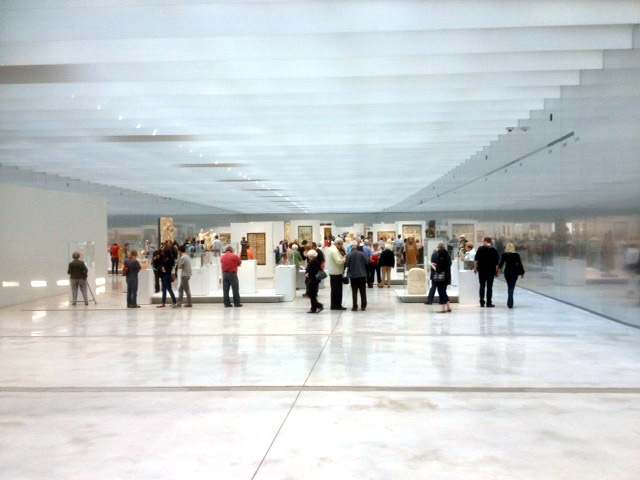 The section where the permanent collection is displayed exists mainly of a very large hall in which a timeline, from the Ancient Egyptians and Ancient Rome up to the 21 century, is depicted on the walls. The sculptures, scriptures, and paintings have all been positioned chronologically. One can find sculptures from the Roman era as well as beautiful paintings from the Golden Age, including works by Rubens and Rembrandt. 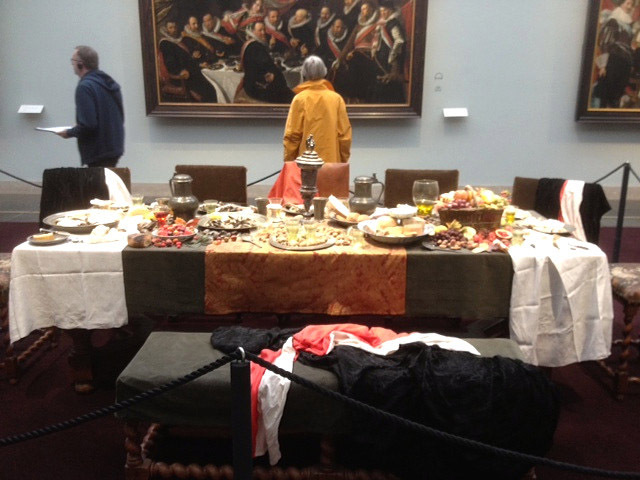 On 18 June, Annet Ardesch and Bert Biemans went to the Frans Hals Museum in Haarlem, to see the anniversary exhibition ‘Frans Hals, Oog in oog met Rembrandt, Rubens en Titiaan’ (‘Frans Hals, Face to face with Rembrandt, Rubens and Titiaan’). This exhibition, which Queen Beatrix opened shortly before her abdication, was organised in the context of the centennial celebration of the Frans Hals museum. To us this exhibition was interesting because Gorcum did not produce any painters who used the style of Frans Hals and Rembrandt in their work. There is only one Rembrandtesque painting by Jan Olis, hanging in the Gorcums museum, which reminds us of that particular coarse way of using the paintbrush. On Sunday 15 September, Annet Ardesch and Bert Biemans visited Woudrichem, as part of the twelfth edition of the Kunstroute (Art route) 2013, where approximately 35 artists and galleries showed their work, predominantly modern pieces, on 14 and 15 September. They went to see the studio of Jan Krale at Hoogstraat 45, the neighbour of the well-known collector Jan Verhoeven, see www.yellow-fellow.org. 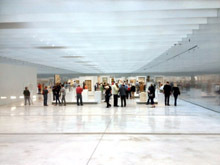 There we found an interesting exhibition of Krale’s abstract paintings. He started painting later in life because of the stimulating remarks by Jan Verhoeven, who could see, due to his extensive experience with abstract art, that Krale was talented. 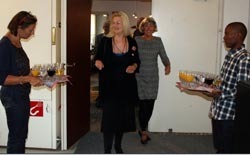 During our visit, Annet Ardesch bought one of his works. 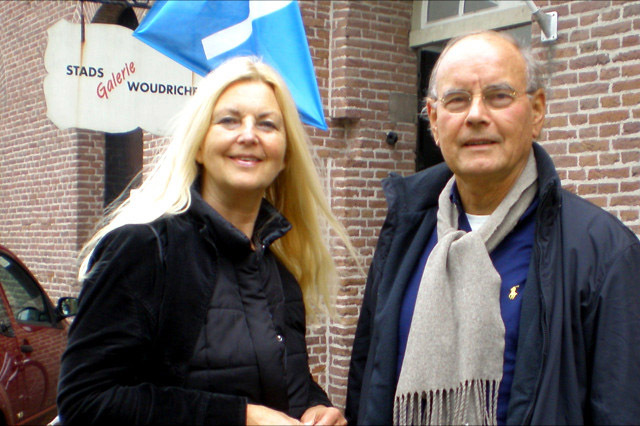 She also met Piet Hartman, former journalist of AD Rivierenland, who now has a wonderful weblog www.piethartman.nl that he uses to publish pieces about Woudrichem and the surrounding municipalities. It was a pleasant afternoon, making the ferry crossing from Gorinchem absolutely worth our while. On 21 September, Annet Ardesch opened the exhibition ‘Vrouw in de kunst’ (‘Women in art’) in Museum De Koperen Knop in Hardinxveld-Giessendam. Nine female visual artists showed their work, with the Woman as their subject. In her talk, Ms Ardesch discussed the role of women in painting from the 17th century onwards, and showed that the percentage of female artists has remained the same. Ms Ardesch also talked about the role that Vincent van Gogh’s mother played in the early development of this artist. 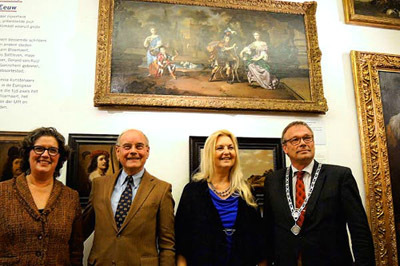 On 28 October in the Gorcums Museum, Gorinchem’s mayor Barske and Ms Albertine Verlinde, director of Sotheby’s in the Netherlands, revealed an exquisite painting by the artist Mattheus Wijtmans from Gorcum. The piece comes from the well–known manor Pabold Hall in Lancashire, where the then owner, Sir Peter Moores, had hung the painting in a guest bedroom. The aristocratic family Van Renesse in Brussels, originally from Utrecht where they had had prominent positions as early as the 17th century, has also owned the work of art. The painting, that measures 75 by 150 cm and has the title ‘Children at the patio of a manor’, shows two boys and two girls in a beautiful Italian looking garden with a pond in which two swans swim. One of the girls wears a dress with an orange, white and blue (“oranje-blanje-bleu”) print, which are the colours of the so-called princes’ flag that was used by the supporters of the House of Orange during the Eighty Years’ War. The oldest boy wears an armour that depicts a coat of arms, and a feather headdress with again the ‘oranje-blanje-bleu’ colours, indicating he was going to join the army later in life. The painting will be studied further to determine who the depicted people are. During the gathering in which the painting was unveiled, the archivist Mr René van Dijk explained that during his investigation into Wijtmans’ date of birth he discovered that the painter was born in 1638 in ‘s Hertogenbosch, rather than in Gorinchem. Eighteen months after he was born, Wijtmans’ parents moved to Gorcum, where he lived for 25 years. In Gorcum he was an apprentice of Hendrik Verschuring and in Wijtmans’ work, you can clearly see the influence of this teacher who was himself inspired by Italian artists. The complete lecture by Mr Van Dijk can be found on our website, under ‘Painters, 17th century’ and then ‘Mattheus Wijtmans’. Van Dijk’s discovery showed that the book by Arnold Houbraken ‘De groote schouburgh der Nederlantsche kunstschilders en schilderessen (1718-1721)’ with biographies of artists from the 17th century is not completely reliable. We are delighted that Wijtmans’ painting has come to Gorcum; the paintings by Wijtmans can be found in Baltimore, Budapest, Cape Town, Dresden, Schwerin and the Louvre in Paris. Today the Gorcums Museum is the only place in the Netherlands that can show one of his works as well.